Not many things in life can be as strong as words. Words can be our source of inspiration or give us a little pick me up when feeling close to the floor. I love inspirational quotes and I tend to put them all over. 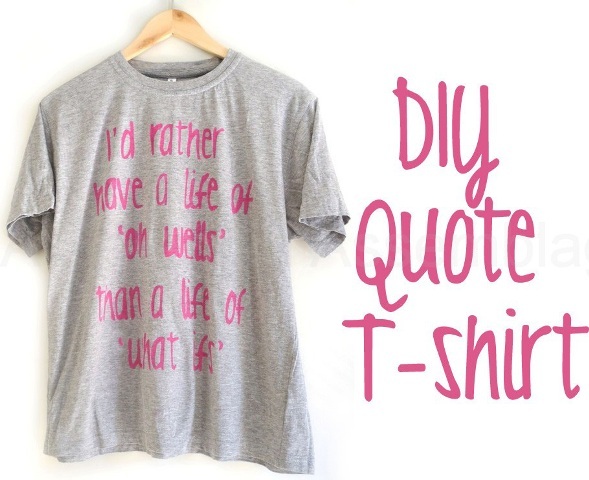 It may be a collage frame on the wall or a pendant with my favorite quote or just a card. 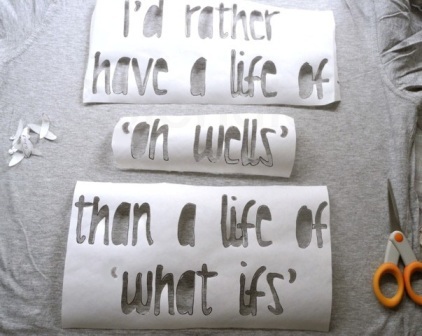 I've wanted to make a T-shirt with such a quote for a long time and I expected it to be much harder than what it came out to be. It was actually very, very easy! I chose the following quote from apparently "anonymous". 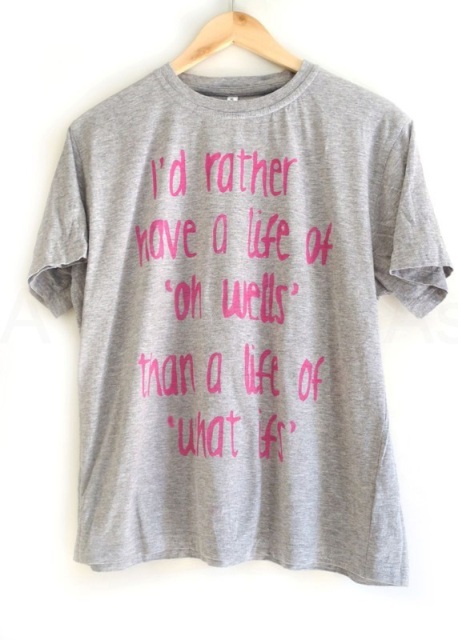 I looked everywhere but could not find its origin so pardon me that: " I'd rather live a life of 'oh wells' than a life of 'what ifs' "
It is a very easy project and you can use any quote or text that you like. Start by either printing your text on the freezer paper -on the mat side- or printing it out on normal paper and then tracing it on the freezer paper with a marker. That's what I did since my printer really did not want to feed on the freezer paper. 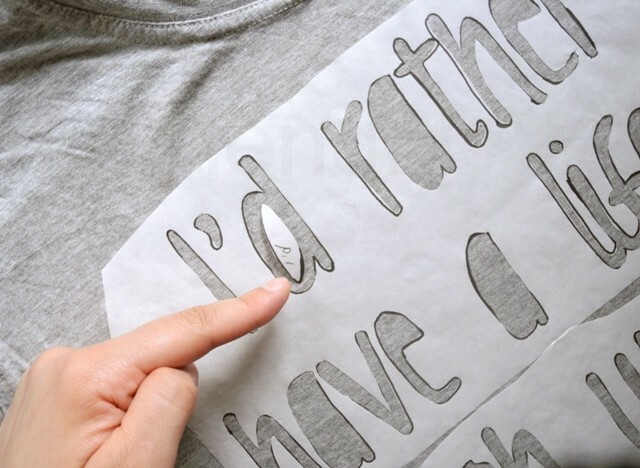 After tracing or printing your text on the freezer paper use the X-acto knife and start cutting on the outline of the letters as if you are tracing them. 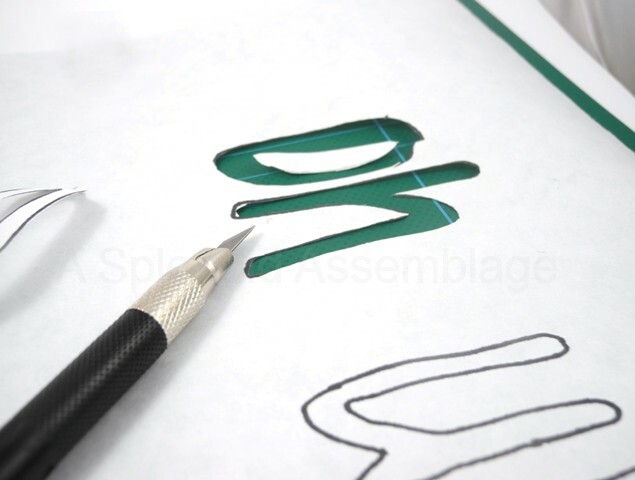 Once you are done cutting the text use your scissors to trim the paper around a little bit. 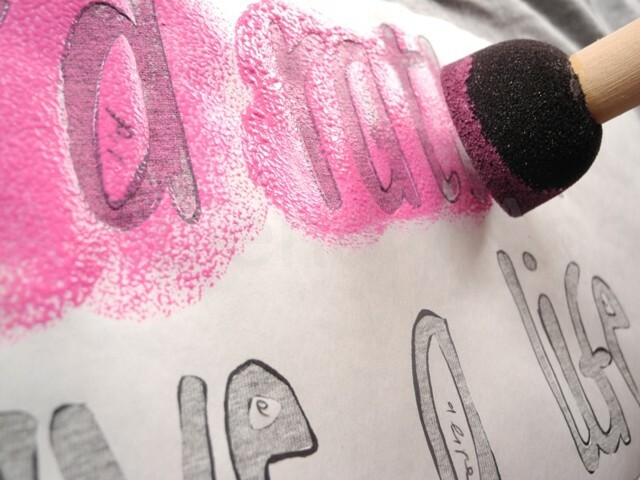 Don't overdo it else you may paint outside the paper once it is on the t-shirt. arranging it as you like it best. 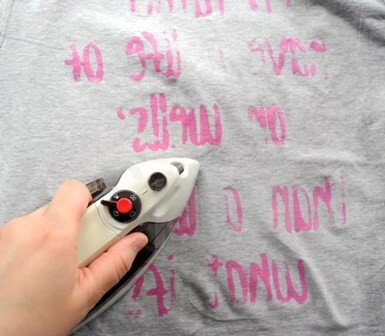 Iron the freezer paper on the t-shirt -glossy side down- and add the small inside shapes to the corresponding letters. To make it easier I wrote behind each of them which word they were cut out of so that I don't mix them up. 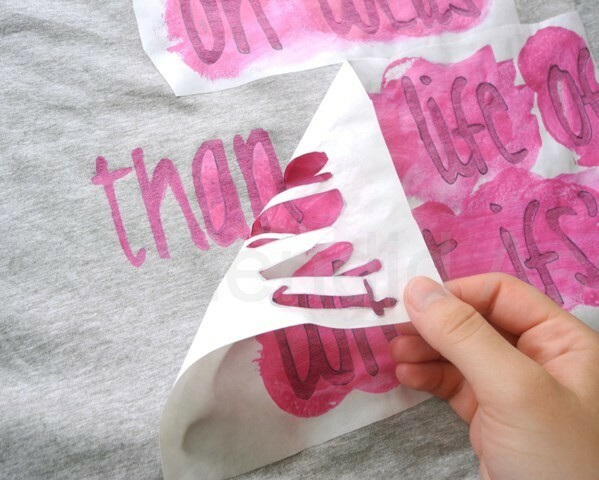 Freezer paper will stay put once ironed so you can now place a piece of cardboard or a plastic bag inside the t-shirt and start painting your stencil. I poured some of the paint in a paper cup and used a foam brush generously applying the paint all over the stencil. Once you have painted your design let the paint dry according to your manufacturer's instructions. When the paint has dried just peel off your stencil. Slowly peel all your pieces including the small ones. The freezer paper peels off so easy that my stencil was intact and ready to be used again. Most fabric paints require a sort of heat treatment afterwards so that the color becomes permanent. Mine required ironing the fabric inside out for 5 minutes. Read your paint's instructions and treat it accordingly. i love how it turned out!!! need to try to do it as well! Hey, I was wondering what size and what font you used? Thank you. 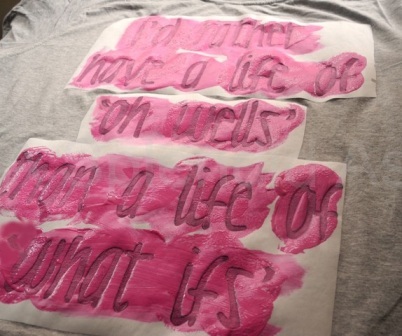 I used 180pt and the font is called "KG Love You Through It"
Does the paint get stiff or hard when it dries? What kind/brand of fabric paint did you use? You can actually use acrylic paint too, it comes in a lot more colors and is cheaper than fabric paint, if you use a textile medium. I've had tshirts that lasted for years without cracking or fading. How long does this last? Will it start to fade or come off? 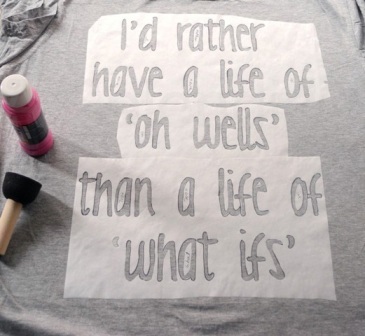 I've been doing the bleach stencil t-shirts... but I want to incorporate more colours, I think this would be a perfect way! 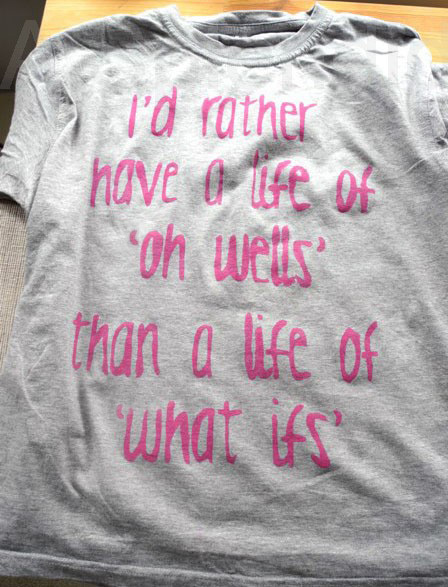 Beautiful shirt and lovely quote! Is it a special paint to clothes? Is it any special paint to clothes? Yes, it is fabric paint. This is such a inspiration post. Thanks a lot for inspired me about to T shirt printing. Nice inspirational quotes as well. Oh that is awesome! 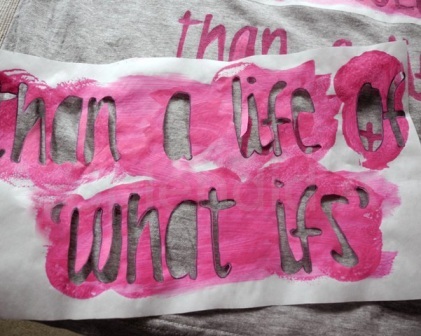 My sister and I are running in a race for the cure and we really want to make custom t shirts because our mother is fighting cancer right now. I will definitely be giving this a try. I just hope that I can get mine to look as pro as yours haha. Wish me luck, or else I will have to go to a company that does t shirt printing in Phoenix. I just hope I can do it on my own.